How wrong I was. This is the best semi-popular book on this topic so far. No other evangelical book takes up the debate on a broad front and at a theological level as well as Groothuis' work. Her analysis of the issues is brilliant, and her critique of the contemporary arguments for the permanent functional subordination of women in the church and the home is devastating. This book was so good that on finishing it I immediately went and bought her earlier work, Women Caught in the Conflict. After reading this, I was confused as to which was the better book. What is so compelling about these two books is the force of argument. Groothuis writes graciously and charitably, yet her rapier sharp mind shines through. She has read deeply in the traditionalists' literature, and point by point she addresses the arguments put forward for the permanent subordination of women. 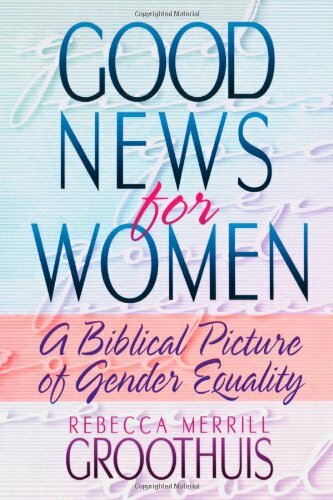 In Good News for Women, Groothuis argues for "biblical equality," which presupposes that every human being stands on equal ground before God, and excludes permanently setting one race, class, or gender above another in status, prerogatives, or privilege. It does not in any way deny that in various contexts one party may be set over another, or suggest that there are no differences between men and women. In the past, Christian men consistently argued that God has set men over women in every aspect of life because God made women inferior to men. In light of the recent social rejection of this idea, traditionalists began to argue that women are in fact equal to men in being and are only functionally subordinated to them in the home and the church. Groothuis identifies this argument as the linchpin of the contemporary traditionalist position. She reasons that if this argument is "flawed, then the entire case for gender hierarchy is flawed" (p 43). She then proceeds to show that it is logical nonsense. In Women Caught in the Conflict, Groothuis points out that traditionalists often do not use well-founded or rational arguments. What they specialize in doing is creating caricatures of their opponents' positions and fabricating "bogeywomen." All feminists are grouped together and blamed for the increase in homosexuality, marriage breakdown, and other ills in society. By consistently using emotive arguments, traditionalists adopt the stance of the legendary preacher who wrote in his sermon notes, "Point weak, speak loudly." These two excellent books demand the attention of those who claim the name evangelical, no matter what side they are on in this contentious debate. For the traditionalists to ignore them and go on repeating arguments that are intellectually and factually false is morally reprehensible. If Groothuis is to be dismissed, factual counter-evidence, better reasoning, and a more honest treatment of Scripture has to be presented by traditionalists.